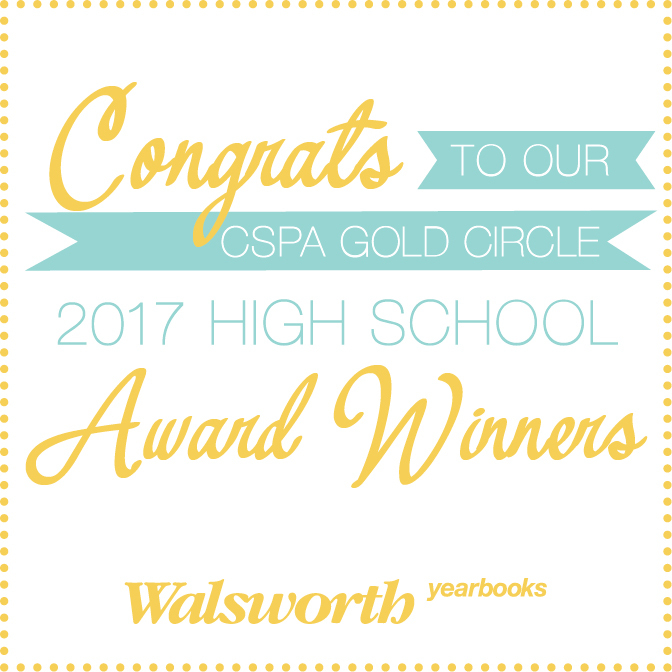 Students from Walsworth Yearbooks schools took first place in 13 of 39 high school yearbook categories, and two of the collegiate categories, when CSPA announced the winners of its 2017 Gold Circle awards on Friday. Each year, CSPA awards Gold Circles to recognize superior work by student journalists in both print and online media. The following Walsworth Yearbooks high schools earned top prizes: Boone High School, Haltom High School, James Martin High School, Mansfield Timberview High School, McKinney High School, Shawnee Mission East High School, Shawnee Mission North High School and Shawnee Mission Northwest High School. Other Walsworth Yearbooks high schools whose students placed in this year’s Gold Circle Contest included: Batesville High School, Calvary Day School, Haas Hall Academy, Highlands Ranch High School, Kiski Area High School, Marcus High School, Norman High School, Saginaw High School, South Fort Myers High School and Timber Creek High School. You can see the full high school results here on the CSPA website. Missouri Western State University and Mount Berry College also had students place in this year’s Gold Circles. The full results of the collegiate contest can be found here on the CSPA website.